Product type: 25 sheets of modular rooms and halls with 2" bands of counters and add-ons. 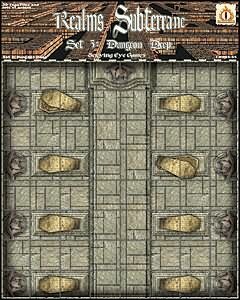 Realms Subterraine Set 1: Dungeon Deep is the ultimate set for any dungeon adventure! Hundreds of basic rooms and halls in 5', 10', 20' and 40'. All the doors are separate, ensuring that you can set up the layout whatever layout that you and your adventure requires. Dungeon Deep is designed to match up with all current and upcoming Dungeon sets. 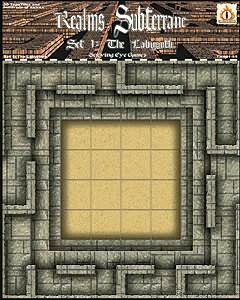 Realms Subterrane 1: The Labyrinth will leave your players with nightmares for weeks! This set of modular maze tiles come in both 5 and 10 foot wide hallways, with a total of 26 different patterns. There are also extra specialized tiles, such as 4 sections of underground river, 4 sections of lava flow, a magic circle, a fighter's sand pit, an underground well, and a grand staircase. The pits in this set are designed to match up with the ones in the Arena Set 1, so mix and match them as you see fit! 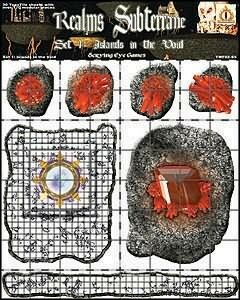 This set will also be fully compatible with our upcoming Dungeons and Caves sets, too. Product type: 10 sheets of modular rooms and halls with 2" bands of counters and add-ons. 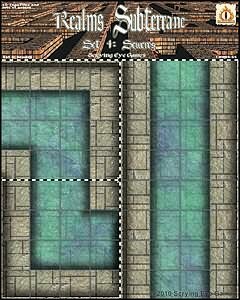 Realms Subterraine Set Expansion 1: The Sewers gives 10 tiles with lots of extras for the to expand the other Dungeon TopoTile set. 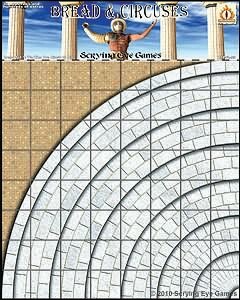 Tiles can be used for 5', 10', 20' and 40' drains and flooded areas for both fantasy and historical sewers. The Sewers set also matches up with our other current and upcoming Dungeon sets. The Islands of the Void is a must-have set for anyone who plans on running a game that involves excursions into the Void or the Ethereal or the Elemental Plane of Air, or even a possible City in the Clouds adventure. There are huge numbers of various shaped tiles, intended to be used for as small rocks floating in the Void. Want to make it harder? Pick a direction on the game board, and designate that as "1". Roll a d8 for each "island" on the board, and count clockwise from that direction. Move that piece one square in that direction. Any piece that hits another "island" forces a dex/acrobatics check. No island can pass thru another island, so any roll that forces that island into something that it already is hitting simply doesn't move that turn. Bread and Circuses Set 1: We Who Are About To Die is designed for you to design whatever kind of gladiatorial arena set you want. Comes with both square and rounded ends, lots of wall sections, and open sandy sections.